As a content management system, SharePoint Online provides great out-of-the-box metadata management capabilities through the Term Store. If your organization uses taxonomy to organize data, then you can simply use what you have by importing your custom taxonomy into the Term Store. If you are a small business, using taxonomy to tag content could mean better governance of how things are described in your company, as well as help build the social fabric or your organization. For example, say that you require SharePoint users to enter certain information about files they upload to the document library. They have to enter the title, author, business unit, audience, and subject for each file. You can leverage taxonomy so that when a user enters metadata in the Audience field, they can choose from keywords already in the Term Store, such as Internal or External. If the user selects Internal, additional options display to choose from, depending on whether the internal audience is for executives or managers. Under Subject, users can select from keywords, such as HR, Legal, or IT. You can also allow users to enter their own keywords to describe the subject. As you see a pattern emerging of frequently used keywords, it may signal you, as the SharePoint Online Administrator, to move those keywords into the main term set. Not only that, but it may prompt your organization to start thinking about creating a new name for a product according to what words best describe it to your people and what those words mean to them. 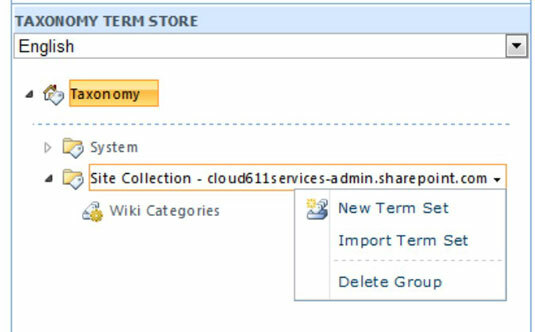 Click Term Store from the left navigation in the SharePoint Online Administration Center. Make sure that your name is listed under Term Store Administrators. Under Sample Import on the right pane, click View sample import file. Download the comma-separated values (.csv) file and make edits to it in Excel to fit your taxonomy. In Excel, arrange the terms in hierarchies up to seven levels deep. Save the file in its original .csv format. Back at the Term Store from the SharePoint Online Administration Center, hover over the group where you want load the term set and then click on the arrow that appears on the right to display additional commands. Select Import New Term Set. From the Term set import window, click Browse. Navigate to the .csv file you saved in Step 5, select the file, and then click Open. You are taken back to the Term set import window. You are taken back to the SharePoint Online Administration Center portal where you’ll see the term set you just imported listed under the group you selected in Step 6.